Claude Monet’s Champ d’iris à Giverny, painted in 1887 during a period of respite from the artist’s extensive travels in Holland, Brittany and, finally, his newly- established permanent studio at Giverny (estimate $3/5 million) . The idyllic , pastoral subject matter of this work encapsulates the central focus of Monet’s oeuvre toward the end of the 19 th century, when he divorced himself from painting urban scenes of Paris and devoted himself fully to his beloved countryside in Giverny. The present work was acquired by the Mellons in 1953 and has remained in the family’s collection since . Jeanne dite Cocotte, et Ludovic Rodolphe Pissarro sur un tapis is one of the remarkable compositions in which Camille Pissarro turns his at ention to his own family as the subject for his art (estimate $800,000/1.2 million) . The canvas depicts two of the artist’s youngest children – Rodo and Cocotte – and was later inherited by his older son Georges Henri Manzana Pissarro, himself an artist. Acquired by the Mellons in 1963, the painting hasn’t been seen in public since 1966 . In 1969, a study for the present work came up for auction at Sotheby’s in London and was purchased by the Mellons. That watercolor and gouache was later included in Sotheby’s 2014 sale of Mrs. Mellon’s Collection, selling for $185,000. The tranquil seaside scene depicted in Le Phare (Antibes) from 1954 exemplifies Nicolas de Staël’s fusion of abstraction with the figurative landscape ( estimate $800,000/1.2 million). 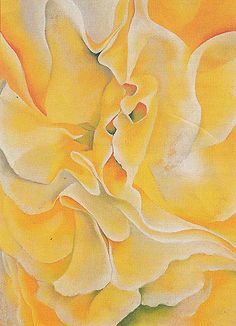 The work reflects the artist at the pinnacle of his output, when he abandoned the palette knife for the paint brush and relied solely on color to create the illusion of space, light and form . Held in the Mellon Family Collection since 1970, the painting is a superb example of the artist’s unique ability to capture the profound intimacy of lived experience within a limited vernacular of purified geometric forms. Marc Chagall’s lyrical masterpiece, Les Amoureux will highlight Sotheby’s that New York Evening Sale of Impressionist & Modern Art on 14 November 2017. A stunning image of the artist’s two great loves – his childhood sweetheart and muse, Bella Rosenfeld, and his adoptive home of France – Les Amoureux encapsulates the best characteristics of Chagall’s oeuvre . The work has remained in the same family collection for nearly 90 years, having been purchased from legendary Pari ian gallery Bernheim -Jeune in October of 1928 – the year it was painted. The enchanting oil on canvas is estimated to sell for $12/18 million during the November Evening S ale. Simon Shaw, Co -Head of Sotheby’s Worldwide Impressionist & Modern Art Department , remarked: “ It is an honor to offer this exquisite painting by Marc Chagall , perhaps his greatest work of the 1920s . Les Amoureux captures at a critical moment one of the most celebrated love stories in art history – the romance between the artist and Bella is palpable, and their happiness is at its very heart . In addition to the painting’s importance with in Chagall’s career, it is truly exceptional to offer a work of this caliber that was acquired so soon after its creation, and which has remained in the same collection since. We have seen a compelling demand for important works by the artist in recent yea rs, an d we look forward to presenting Les Amoureux this fall .” Sotheby’s set the current auction record for any work by Marc Chagall in May 1990, when we sold his 1923 painting Anniversaire for $14 .9 million . Similar in subject matter to the present work , Anniversaire depicts the starry -eyed lovers sharing a kiss while, q uite literally, floating on air . The artist met Bella Rosenfeld in Vitebsk in 1909 and the couple became engaged within a year, shortly before Chagall’s first trip to Paris in the summer of 1910. During the a rtist’s first four years abroad, he and Bella would correspond frequently and his homesickness for Russia became enmeshed with his desire for his distant fiancée. Following Chagall’s return to Russia and his marriage to Bella, paintings depicting the couple dominated the artist’s work. In 1916 -17, he created four oils of the two embracing on abstracted backgrounds. It was in these years that the couple in flight – a trope that would become one of Chag all’s prime pictorial devices in later years – became firmly established. Just as Bella inspired many of the works in his oeuvre, France also became a prominent source of inspiration for the artist. Chagall arrived in Paris at the young age of 23; within his first two days, the artist visited the Salon des Indépendants, where he observed works by André Derain, Fernand Léger, Henri Matisse, Pablo Picasso, and Robert Delaunay, who would later become Chagall’s mentor. During this time, the artist lodged in La Ruche , the legendary block of studios in Montparnasse known for its lively bohemian atmosphere and diverse array of inhabitants, next door to Amedeo Modigliani and Chaim Soutine. It was in this milieu of spontaneity and rich cultural exchange that Chagall began his first period of painting in Paris. Chagall returned to his beloved city with Bella , and their first and only child, Ida ,in September of 1923 and remain ed there until 1941, when World War II forced them to flee to the US. With his great loves with him in France, Chagall was able to fully enjoy his adopted home country. All of the portraits of him and Bella together during their time in Russia were now imbued with a new -found peace and tenderness in this new stage of their life together. These years in France were particularly fruitful for Chagall , marking a period of comm ercial and critical success, happiness and security . Having returned to the C ity of Light after a nine -year hiatus, the artist found a new equilibrium of mind, a peaceful atmosphere and an audience . Young Surrealists welcomed him back to Paris , and in turn Chagall was pleasantly surprised to find that they supported a changing attitude towards the sort of dream -like poetry painti ng he pioneered many years before. Despite their flattery, Chagall declined the group ’s invitation to join the 4 movement, though his influence can be seen throughout their work , from ambiguous space to collections of objects. The moon and sky of the present work , for example, evoke René Magritte’s composition s of later years. Sotheby’s will present Pablo Picasso’s Buste de femme au chapeau as a highlight of their Impressionist & Modern Art Evening Sale in New York on 14 November 2017. Characterized by its vibrant color palette, sharp angularity and bold form, the portrait is a salient example of the Madonna-and-Magdalene dichotomy that manifested in Picasso’s work while he was simultaneously involved with two of his greatest muses: Marie-Thérèse Walter and Dora Maar. This tumultuous time in the artist’s life in turn yielded one of the most groundbreaking and creative periods of his oeuvre. The daring oil painting is being sold to benefit charitable organizations including the American Society for the Prevention of Cruelty to Animals (ASPCA), and carries a pre-sale estimate of $18/25 million. The present work illustrates a particularly turbulent time in the Picasso’s life – his mother died in January 1939, during a period of intense political upheaval throughout Europe and particularly in the artist’s native Spain. However, this period also provided the impetus for some of Picasso’s most revolutionary stylistic techniques. Unable to travel to Spain and living in a country facing increasing pressure from Nazi Germany, Picasso maintained relationships with both Marie-Thérèse and Maar. Both of the women, markedly different in their temperament and physical appearance, populated Picasso’s life and his paintings, and the present work is a strong manifestation of their shared influence throughout his oeuvre. While many attributes of Buste de femme au chapeau point to Marie-Thérèse − the blonde sweep of hair and bright-yet-soft tonalities of the palette − whispers of Maar are also reflected. 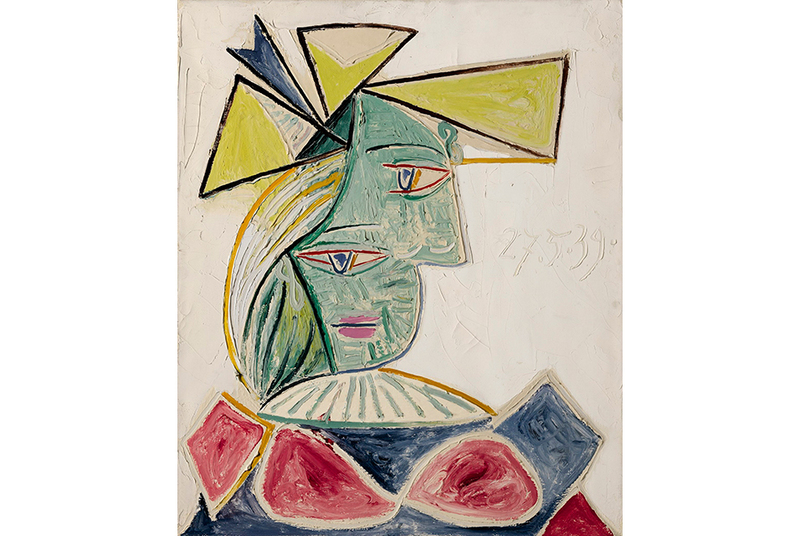 In contrast with his depictions of a more passive Marie-Thérèse, the present painting is one of Picasso’s most animated, tactile and sculptural renderings of the young woman. Her figure is punctuated with incisions into the thick paint, adding dimension to her features. Maar’s presence appears vis-a-vis the artist's focus on Marie-Thérèse's hat. While the accessory may have been important to the sitter at the time, its significance in this painting is elucidated in retrospect. Maar was immortalized in Picasso's portraits as the wearer of stylish hats, and what may have been an flamboyant personal item to Marie-Thérèse at the time, becomes a symbolic indicator of her status as the saintly new mother of Picasso's daughter, and the antithesis of her new rival.